How to Play DVD on Windows 10? Windows 10 won't play DVD? Windows 10 DVD player not working? Try some alternative freebies to play any (copy-protected) DVD on Windows 10 with no hassle. How to play DVD on Windows 10 PC for free? Paid $14.99 for the stand-alone Windows 10 DVD Player app available in Windows Store but unfortunately find that the Windows 10 DVD player not working for some reasons and Windows 10 still won't play DVD? Don't bother any more. Why not try the best easy-to-use free DVD player for Windows 10 which can smoothly play any home-made/protected/region-code-locked DVD on Windows 10 computer by simply inserting the DVD disc and clicking the "DVD" button on its main interface. – A 100% clean, safe and free DVD player compatible with Windows 10/8/7, Mac, etc. is especially designed for playing DVD movie on Windows 10/8/7 or Mac computer, be it regular DVD or copy-protected DVD. -	This best all-in-one free media player also enables users to freely play all 8K/5K/4K/HD 1080p/720p/SD videos in MP4, AVI, WMV, MKV, MOV, FLV, H.265, H.264, etc., as well as play all music files in MP3, AAC, AC3, FLAC, WMA, WAV and more. -	It also can free download videos/movies/MP3 songs from YouTube and 300+ video sites, and allows you to stream videos/audios to iPhone, iPad, Apple TV, etc. for free. 5KPlayer is the top recommended free Windows 10 DVD player which can play any DVD movie on Windows 10 flawlessly, incl. latest Disney movie DVD. Many people love it because it is such versatile and is very easy to operate for its extremely simple and beautiful design. 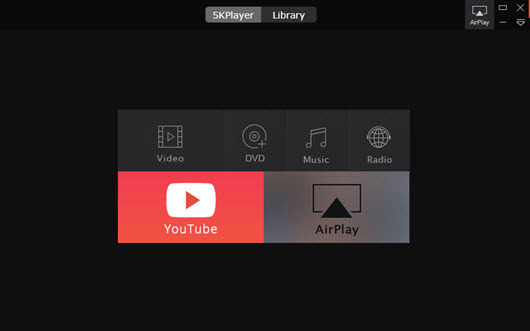 To make it clearer, 5KPlayer is an ultimate combination of free DVD player, free video/audio player, free (YouTube) video downloader, movie/music streaming software, video converter, which works perfectly on Windows 10/8/7 or Mac computer. It is worth the name of best free media player 2019. Free download and install 5KPlayer on Windows (10) computer, and you can then play any DVD on Windows 10 PC right away by 2 simple steps. Insert the DVD disc to the DVD-ROM. If your Windows 10 computer doesn't have a DVD drive, you may connect it with an external USB DVD drive and then insert the disc. Or you can rip DVD to MP4, AVI, WMV or other Windows 10 compatible video formats first, and then play DVD digital video files with best media player for Windows 10 with ease. Tip: This powerful free DVD player for Windows 10 can also play DVD ISO Image file/Video_TS folder from the File menu. Just hit "DVD" button on the main interface, the smart free player will auto load and play the DVD movie immediately on Windows 10. The image quality is original and the playing process is smooth. A totally free DVD ripping tool enables you to rip DVD to Windows 10 compatible formats as MP4, WMV, MPEG, H.264, etc., incl. perfectly rip copy-protected DVDs which are encrypted with DVD CSS, UOP, RCE, region code and Sony ARccOS protections. Smooth and fast. Aside from taking a free Windows 10 DVD player to play DVD on Windows 10 for free, many people also choose another way to watch DVD movie on Windows 10 computer, namely, convert DVD to digital files with a top free DVD ripper for Windows 10. Better still, in this way, you can watch any favorite DVD movie anytime and anywhere you like without inserting the DVD disc every time, and also protect the DVD disc from being scratched or damaged. 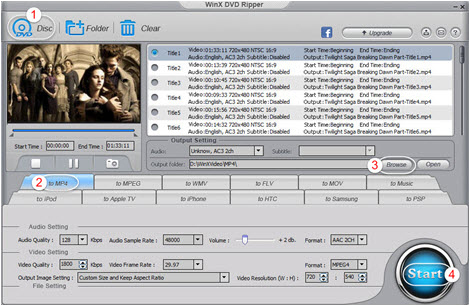 WinX DVD Ripper, one of the most popular and easy-to-use free DVD ripper, enables you to rip any DVD to WMV, MP4, MPEG, H.264, etc. for free for later playing DVD movie on Windows 10/8/7, etc. by bypassing DVD copy protections and region codes. With advanced encode engine and Hyper-threading tech, it can deliver best video audio quality and superfast conversion speed. Free download and install WinX DVD Ripper on your Windows (10) and the 3 simple steps below will guide you easily rip DVD to MP4, WMV, etc. for free. Step 1: Insert the DVD disc to the DVD-ROM or external DVD drive. Launch WinX DVD Ripper and click "DVD Disc" button on the top left. It will auto load the DVD and detect the right main DVD title for you. Step 2: Choose output format. For playing DVD on Window 10, this top DVD ripper allows you to rip DVD to MP4, WMV, MPEG, H.264, etc., which are all Windows 10 computer supported video formats. Step 3: Start ripping DVD for free. Hit "Start" button to begin to rip DVD to MP4, WMV, etc. with the best DVD ripping software for later DVD movie free playback on Windows 10 computer. A 100% clean, fast and user-friendly DVD ripper can rip any copy-protected DVD (incl. newly-released Disney DVD) to MP4, AVI, WMV, MOV, M4V, MPEG, H.264, HEVC, iPhone 7/Plus, iPad Pro, Galaxy S7/S7 Edge, etc. with original quality at fastest speed for easier DVD playback on Windows 10/8/7, iPhone, iPad, Android, etc. UDF DVD Movie Won't Play on Windows 10? Solved! [Solved] Windows Media Player Won't Play DVD on Windows 7/10 etc.